Home> Novatech How To >Having HD playback issues? Sumvision Cyclone Micro 3 to the rescue. Having HD playback issues? Sumvision Cyclone Micro 3 to the rescue. There are so many neat techniques out there to play files on your TV from your desktop/laptop nowadays, but personally, as a novice I’ve always played files via an external hard drive plugged in to my Xbox. As file sizes increase due to high definition and more advanced encoding techniques, the range of formats has also increased too and become more confusing. “A what-vision box?” I say. Step forth my new hero. 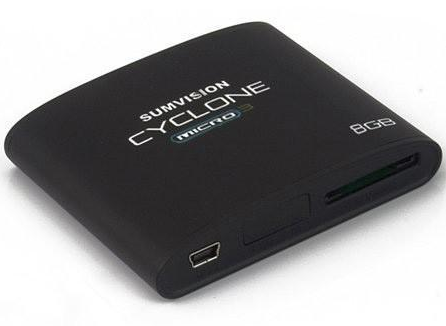 The Sumvision cyclone box allows me to connect an external device with my files on it (from a hard drive, an SD memory card or even a USB stick) and then connect this to my TV via a HDMI cable. And I’m sorted. They also come with 8GB built in memory which means you can transfer files onto it directly and take it anywhere with you. It can be USB powered and one of our customers even uses it in his car, but it comes with a separate power source should you need it. You will need to have a HDMI cable as one does not come with it but you do get a host of USB cables and a tidy little remote control too. In fact Techradar points out that “You can also watch through composite video or your TV’s aerial socket (cables included). Coupled with its very small size, it’s ideal for taking on holiday, where you might not know in advance what connectivity your hotel TV has.” Full review here. When I go away to visit family this box is truly invaluable. As a tired chap with a young son who’s addicted to watching Thomas the Tank Engine early in the mornings, all I need to do is load his collection of Thomas episodes onto it and hook it up to granny’s TV, and the potential of extra Z’s in the morning is on the cards. And when I’m being serious at work, visiting customers or at exhibitions, I can use it to power slideshows and presentations simply and easily through any monitor or TV, there’s no need for a PC or specialist software. For ease of use, convenience, portability and general all round excellence for less than a large round of beers (if you’re in London especially) this is one of our devices of the year. To view it in all it’s glory, head here.